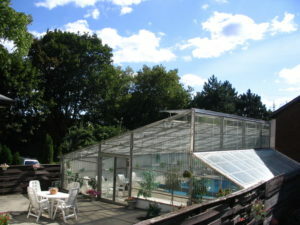 Check out all the advantages of a Rogers Pool Enclosure! Imagine your pool clean, safe and insect free. A quiet yet tranquil paradise completely for your enjoyment. Swim year round protected from the outside elements. 6′ Wide Patio Doors c/w Screens. Structure: Heavy-Duty Galvanized Steel Understructure. Tempered Glass, Twin Wall or Corrugated Poly Carbonate Glazing. 2 – 6′ Wide Patio Doors. Engineered to Exceed Building Codes. Note: Aluminum structure, Painting will have a additional charge.